Thank you for being such wonderful customers and allowing us the time to celebrate the Christmas season with our families! We also want to share with you one of our favorite Christmas poems. Written by Henry Wadsworth Longfellow on Christmas Day in 1863, his poem "Christmas Bells" has since been set to music and become one of our country's most beloved Christmas carols: "I Heard the Bells on Christmas Day." The last verse is especially uplifting and beautiful. Merry Christmas and a Happy New Year to each of you! May this Christmas season be a joyful one for you and your families! 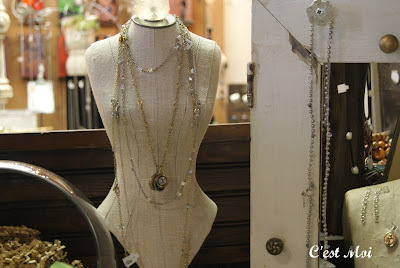 Anyone who read this post we wrote in September knows how very proud we are of Emily Little, owner of Little E Studio. In addition to her extraordinary talent, she has also shown amazing resilience in the midst of a very difficult trial; soon after she received her licensing deal with Creative Co-Op her home was destroyed by a fire. She and her family have been unbelievably positive and upbeat, despite the loss of most of their possessions. This included almost all of Emily's artwork. We are happy to announce, however, that several pieces were salvaged and restored to their original state. These pieces are very near and dear to Emily's heart. While she doesn't normally name each one she creates, these have been given special names to commemorate, in a small way, the journey Emily and her family have experienced in the past few months. The first one is called "Best Seat in the House." We love the bold colors as well as the bird silhouette. It's a classic Little E Studio design! 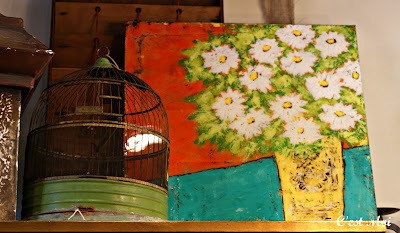 This bouquet of daises has been named "Beauty from Ashes." It's a simple, happy, uplifting image, especially when we consider that this beautiful work of art actually was brought forth from the ashes left behind by the devastation of a fire. 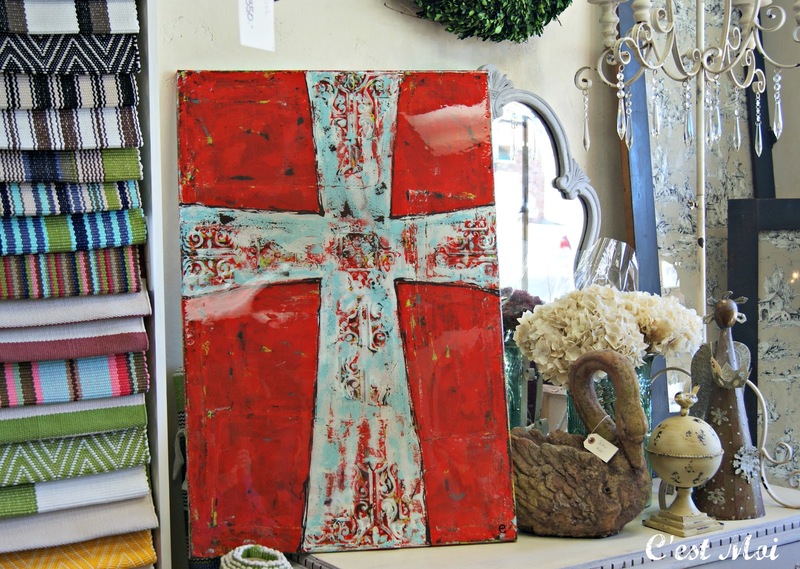 Emily named this stunning, vibrant cross "Answered Prayers." We know Emily and her family have had many of those and their faith in moving forward continues to inspire us. Those who have not seen Emily's work in person and are planning to stop by this week are in for a real treat. As beautiful as they are in photos, they're truly breathtaking in person. We're so glad to have them back! It's easy to become overwhelmed by picking out wrapping paper, bows, ribbon, and tags for Christmas presents. Sometimes simple is better. 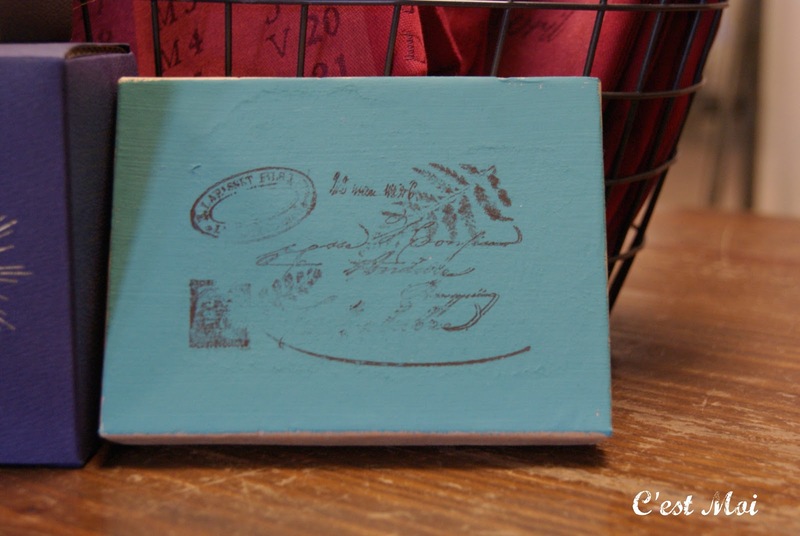 We spruced up this little cardboard box by using CHALK PAINT on the lid and stamping it with black ink. Voila! A cute, unique gift box just waiting to hold a Christmas surprise! 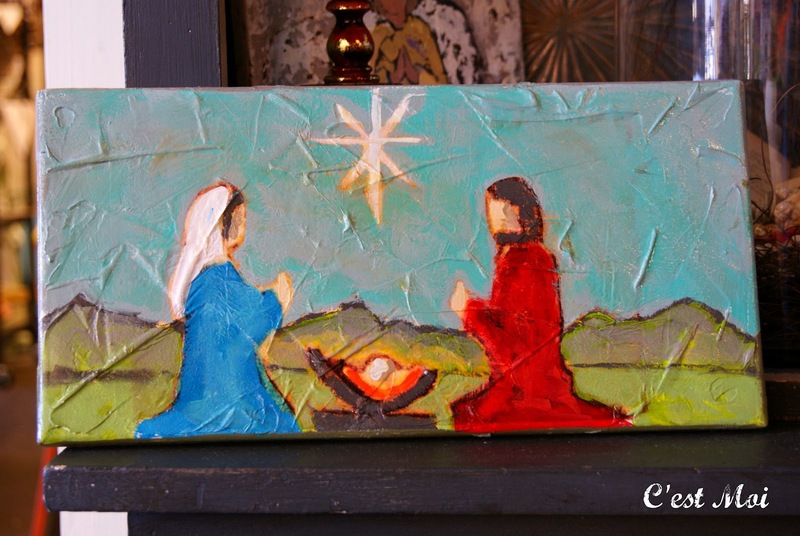 Jennifer Utterback's art work is a Christmas surprise anyone would be happy to receive! 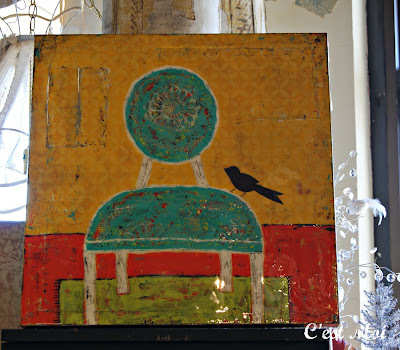 Jennifer layers acrylic, glaze, oil, and even coffee to create beautiful abstract pieces. 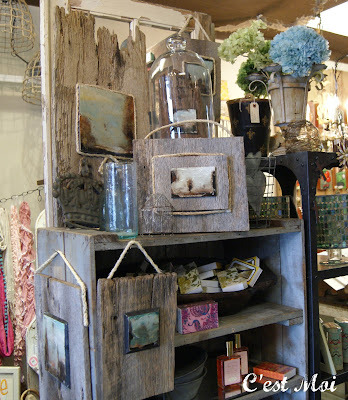 The earth tones she uses in most of her work pair perfectly with the reclaimed wood she mounts them on. We love the elegant, rustic look of Jennifer's art! 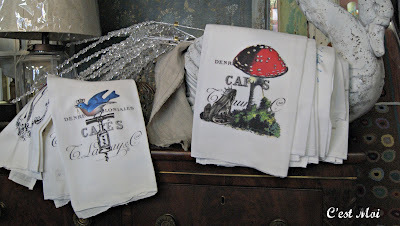 Of course, we can't talk about art without mentioning Ms. Kellie Montana. These "Mini Montanas" are some of our favorite ornaments in the store. 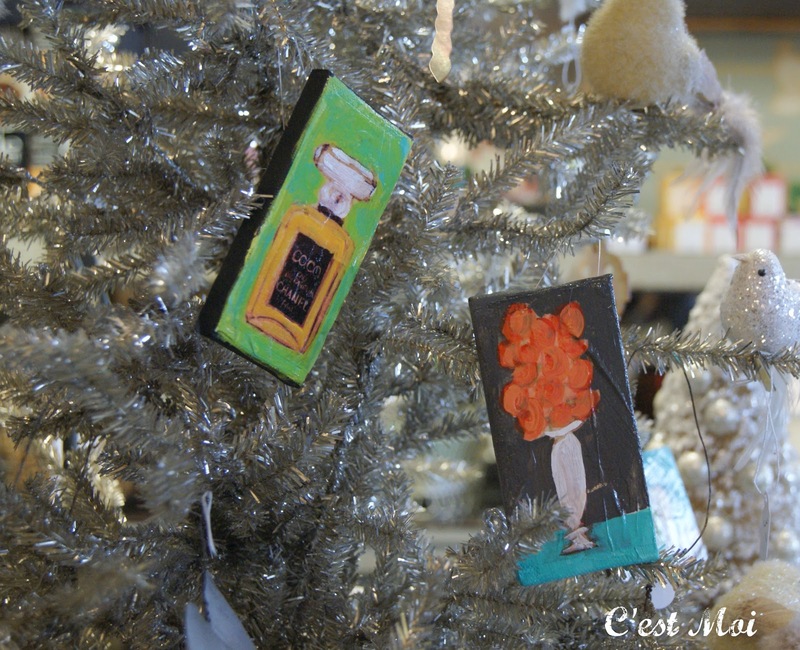 We've never been able to make handmade ornaments quite this sophisticated looking, and they're a great way to add a little something special to your tree without all the work! 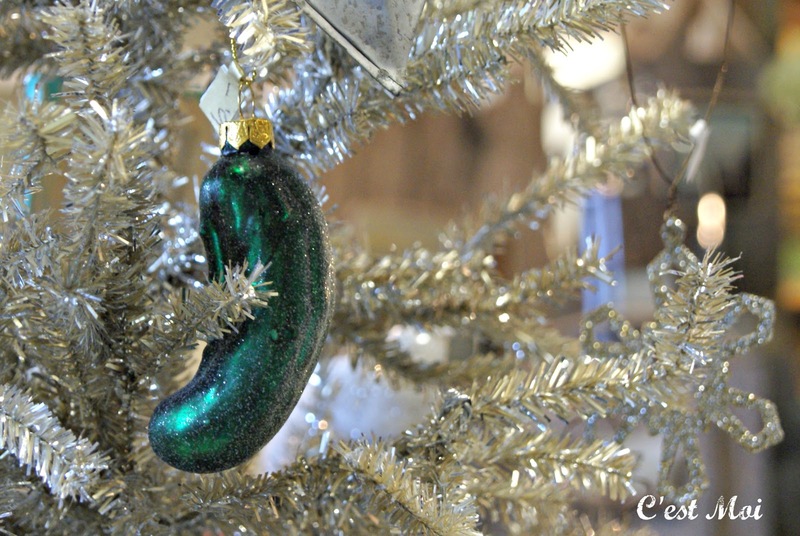 Speaking of ornaments, for those of you who follow the tradition of the Christmas Pickle (Weihnachtsgurke), C'est Moi has you covered! 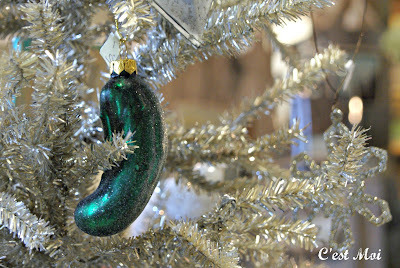 Hide this adorable ornament in your tree on Christmas Eve. The first person to find it on Christmas morning receives good fortune for the following year. 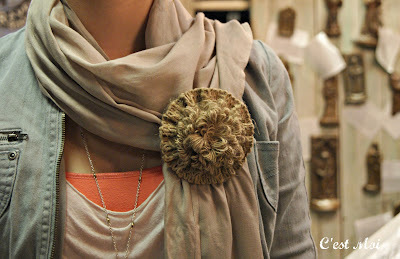 or pin them to a scarf! Wherever you use them, they're too cute to go unnoticed! If you've never been to the Nashville Flea Market, you are missing out. 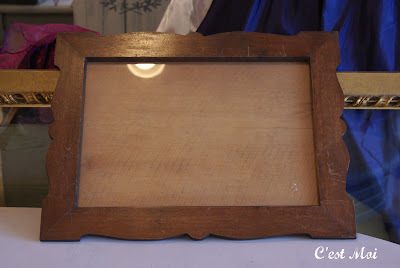 We found this "beauty" of a frame tucked away in a stall there. It's actually one of a pair; we've already spruced up the other one, and it's definitely become the better half! Our first step was to use the Annie Sloan Work Book to come up with some possible color combinations. 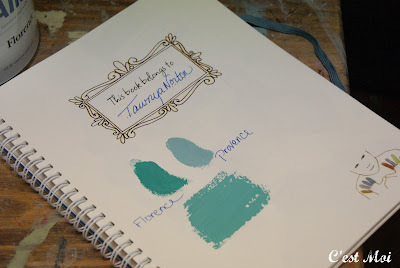 As you can see, our first step was to mix Florence and Provence to create a beautiful Tiffany Blue shade. Here's a look at everything we used, including the finished product (the back of the frame; we'll show pictures of the finished frame in a later post.) 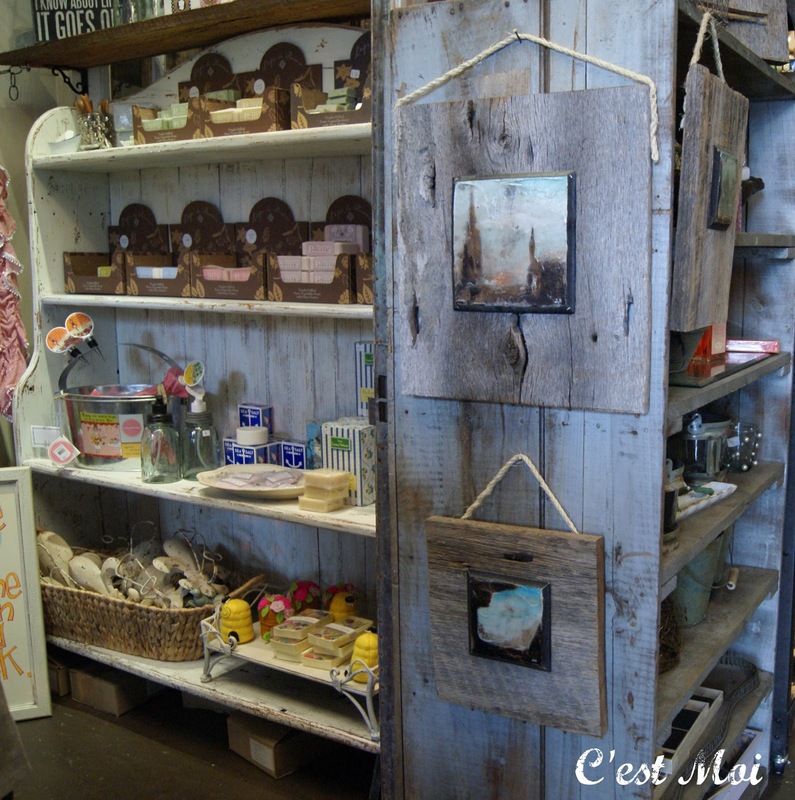 The list includes Annie Sloan CHALK PAINT™ in Florence, Provence, Country Grey, and Chateau Grey, as well as chip brushes, a roller (not pictured) and two small stencils. That's it! 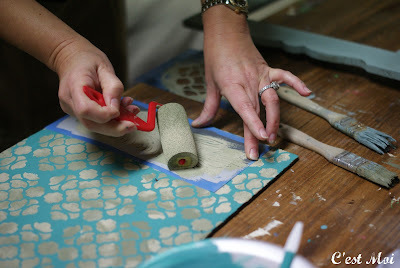 The first step was painting the board in the blue shade we created. 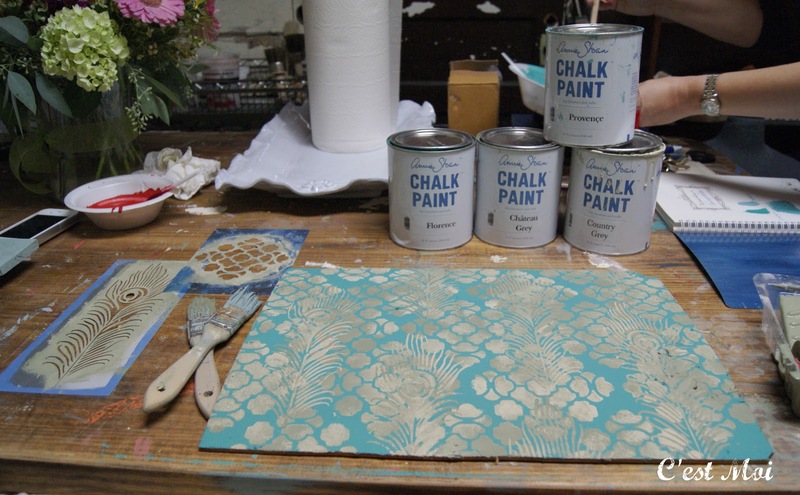 Then, we placed Chateau Grey and Country Grey side by side in a small paint roller tray, applied the paint to our roller, and painted on the first stencil. We then followed the same steps with our second stencil, a peacock feather design. These stencils are inexpensive and can be picked up at any craft store, so they're great to experiment with! Here's the finished product! 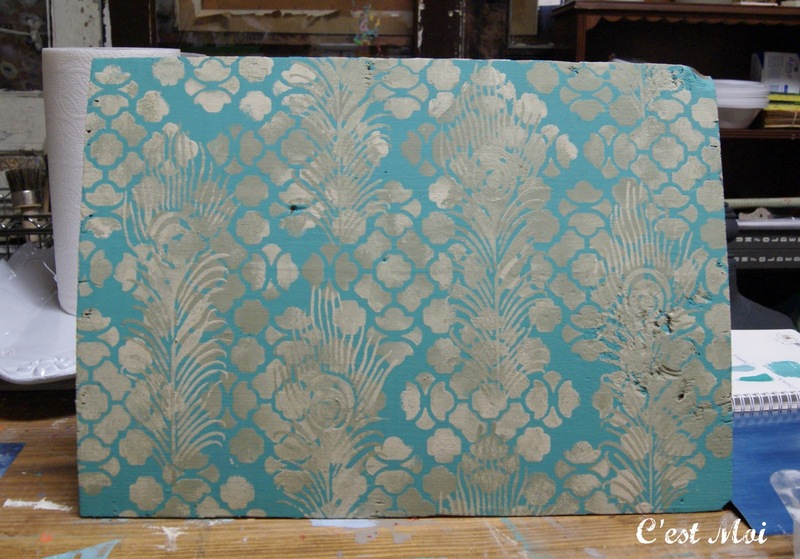 You can see the shading of the Chateau Grey and Country Grey along with the layered stencils. This is a technique you can learn how to do yourself in one of our Advanced Workshops. They're filling up fast for January and February, so be sure to reserve your place soon! We also have received some lovely new products; these screen printed flour sack tea towels are simply gorgeous. The vintage designs and vibrant colors have quickly turned them into a best seller. They would make a great Christmas gift! 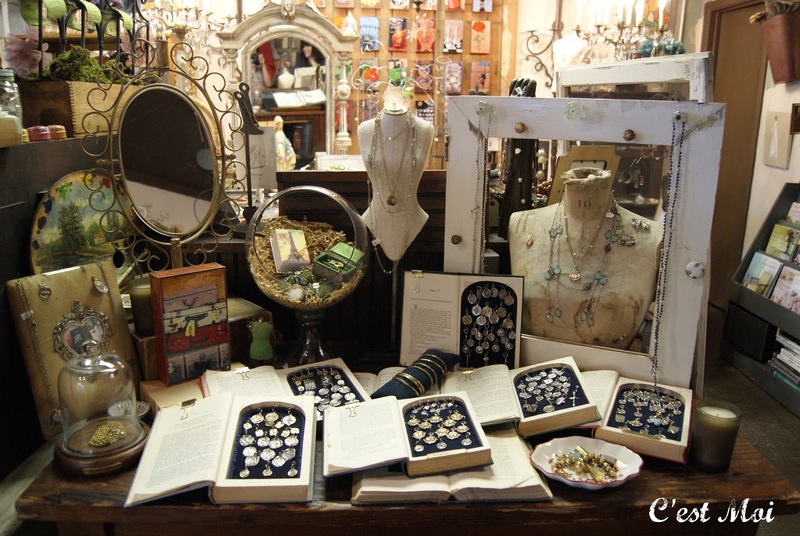 Jewelry is, of course, a classic Christmas gift as well. 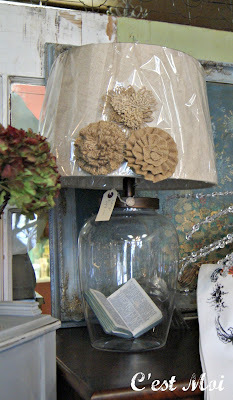 We have plenty to offer; some of our favorite designs have recently arrived but they are moving quickly! Although we love the many rings, charms, and bracelets we received, long dainty necklaces like these might just be our favorite. We love the layered look, and they just seem to be made to mix and match. Don't forget to call us to reserve your place in one of our Advanced Workshops!